The end of summer is coming all too soon. Make the most of the season and help your kids connect with nature with these simple, free or low-cost activities, suggested by AMC authors, parents, and naturalists. 1. Take an ice cube bath. When it’s too hot to move, bring a bowl of ice cubes outside and take turns melting them on your bodies. Which tickles more, behind the neck or behind the knee? 2. Pick your own berries. Visit a local farm and try to put more in your pail than you eat. If you’ve missed berry season, make plans for pumpkins and apples. 4. Study the seashore. Bring a guidebook like AMC’s Seashells in My Pocket to the beach and see what you can identify in the sand, water, and tidal pools. 5. Try “watercolor” sidewalk and body painting. On rainy days, chunky colored sidewalk chalk and bathtub crayons take on new dimensions outdoors, and can be fun even for older kids. Try creating watercolors on the sidewalk, or body art with the crayons, and have fun getting wet. 6. Make mud. Bring a pail of water to your backyard (or any area it’s OK to disturb) and build miniature dams, canals, mudworks, and mud castles. Use a few cups of different sizes, a shovel, and a funnel. 7. Take a hike. Remember to bring plenty of snacks and water, and look for payoffs like waterfalls or swimming holes. 8. Camp at home. Set up a tent in the backyard or in the living room! Let the kids invite friends over, take turns telling stories, and make s’mores (the marshmallows can be “raw”). 9. Play landscape painter for the day. Set up an easel and paints outdoors, or bring paper and colored pencils, and try to capture what you see (or convey the feeling with colors and shapes—don’t worry if you can’t draw). 10. Walk a block. After dinner, head out for a short family walk around your neighborhood. What signs of life do you see? Do you have other suggestions for fun and easy outdoor activities with kids? Please share them in the comments. 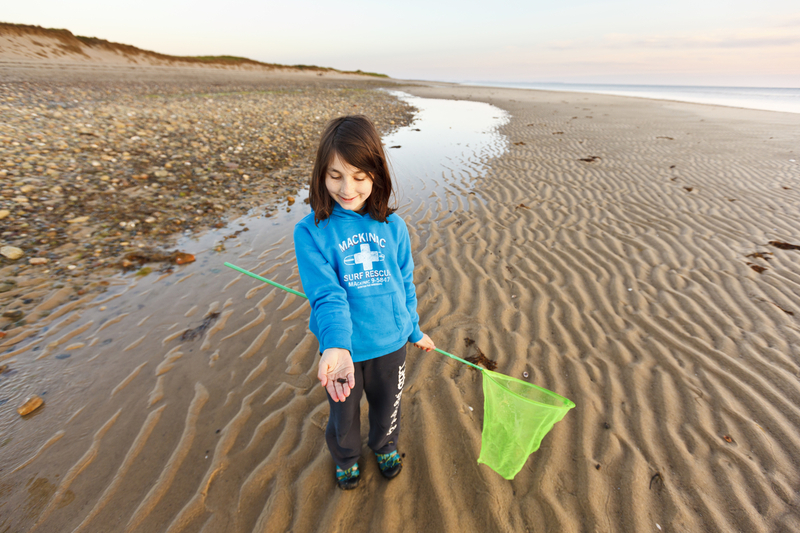 Photo of a young girl hunting for crabs on Bound Brook Island, Cape Cod National Seashore, in Wellfleet, Mass., by Jerry and Marcy Monkman.